Swiki is a potentially unwanted application that our security research experts categorize as adware. This program is promoted as a browser add-on that can help you to improve your online search experience. It is supposed to help you collect search results from Wikipedia, YouTube, YellowBook, Twitter, Amazon, Yahoo Search and other websites. However, if you did not plan on having this application on your computer, we strongly recommend removing Swiki from the system. Swiki may inadvertently lead to severe computer security issues because this application supports third-party advertisements and could be exploited by malevolent third parties. 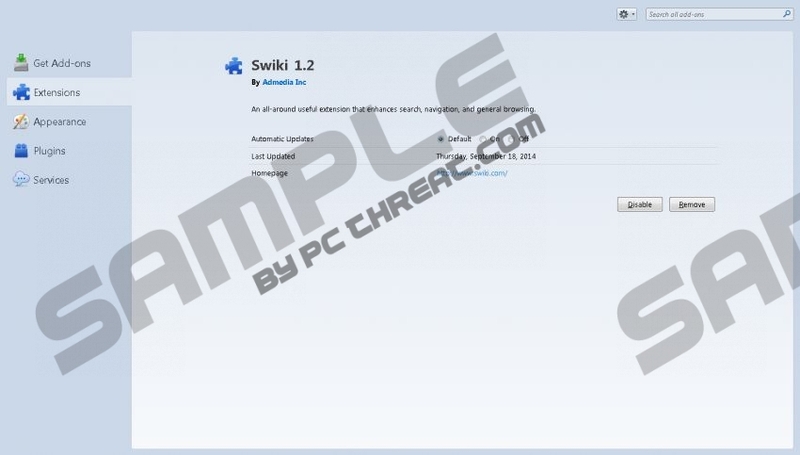 There are two main ways to download and install Swiki onto your computer. First, you can download the application at swiki.com. In such a case, you should be well aware that the program supports advertisements and that you will be seeing some sooner or later. However, based on our research, we can tell that Swiki may also arrive bundled with fake Java, Adobe Flash and various media player installers. If that is the case, then you most probably do not even notice how Swiki gets installed on the PC because you are focused on something else. The next thing you know, there are commercial advertisements popping up on your browser. When the installation takes place, Swiki adds plug-ins on Internet Explorer and Mozilla Firefox web browsers. The application does not seem to work on Google Chrome web browser. Within 24 hours since the installation Swiki will start displaying commercial ads. Before the ads appear, the application collect information on your web search queries and the websites you frequent. This information allows Swiki and the third parties, responsible for the ad content, to generate links on the ads, related to your overall likes and preferences. It should increase the possibility of you clicking the aforementioned ads, but you should know better than that. The main security concern associated with Swiki is its commercial ads. The application is not liable for the third-party content embedded into its advertisements. Hence, if it starts displaying a lot of annoying ads, do not click them – the best way to get rid of them is to terminate Swiki itself. You can uninstall Swiki via Control Panel although you will need to delete the Mozilla Firefox extension from the browser manually. If this application has entered your computer bundled with other freeware, you should run a full system scan with SpyHunter free scanner. A full system scan will help you detect other unwanted applications, and you will be able to get rid of them immediately. Do all you can you protect your system from harm. Move mouse cursor to the bottom right of your screen. Open Uninstall a program and remove Swiki. Go to Uninstall a program and remove Swiki. Select Add or remove programs and uninstall Swiki. Disable and remove Swiki from Extensions. Quick & tested solution for Swiki removal.